In a word this post is about longevity. 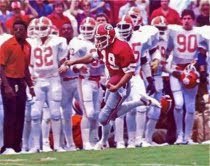 You can talk about the longevity of Scott Woerner's football career - from eastern central Texas he went to the glory of Sanford Stadium and then on to a professional career in the NFL and the USFL. But my case for Scott Woerner to be included in the College Football Hall of Fame centers on the longevity of his impact in the history of Georgia Bulldogs football. Thirty years after he left Athens, Woerner is still remembered for his dedication to his team, his knack for making big plays and helping the Dawgs win the biggest game in its history. And isn't that how players of any sport should be measured, by the duration with which they remain in the collective mindsets of fans? Regardless of the arena, sports are there for the public's consumption. They exist to entertain. The fan's memory becomes the measuring stick with which all athletes' résumés are judged. Did he change the complexion of the game? Did he play bigger when the game was biggest? Did he impact the history of his team and sport as easily as he did the final result on the scoreboards? Difficult questions and complicated answers. After all, when we're talking about the College Football Hall of Fame we're talking about the greatest of the great. And to this Georgia football fan, there are few any greater than Scott Woerner. I've explained before that I did not grow up specifically as a Georgia Bulldog. But I was taught to appreciate college football the way that any southern boy should. And as a kid in Athens GA during the 1970's and 80's you could not escape the frenzy of Herschel Walker, Coach Dooley and the Junkyard Dawgs. Their pictures were on billboards everywhere, and their voices were on the radio at every commercial break. Of course now those days come to me in a flurry of mental images. Erk's forehead is one as well as Herschel's tremendous thighs that both battered defensive backs as well as blew past them in a flurry. On a national scale I recall Oklahoma's odd looking yet remarkably powerful wishbone and the stoicism of Bear's gaze underneath that houndstooth hat. There were also the plaid sports coats of the announcers and the live shots of the scoreboard clock that they cut into the picture frame, the one that wavered like a sniper's crosshairs when the wind blew. Those are all images that helped indoctrinate me into the religion of college football. More locally, and even before Herschel flipped his quarter to come to Athens, it was Scott Woerner's appetite for being near the football that impressed me the earliest. Even as a youngster of eight or nine I recognized the importance of interceptions and reversing the field with elusive returns, ones that were like skipping a rock upstream. And there was none better than Woerner. He once amassed 190 yards in one game against Kentucky just returning kicks. During the greatest of all seasons for the Bulldogs Woerner totaled 488 yards returning punts, which put him over 1000 for his career. His mark of 15.7 yards per return in 1980 is a school record that still holds today. It's no wonder that Larry Munson coined the nickname Woerner the Returner. But #19 didn't just change the game on special teams. Woerner finished his collegiate career with 13 interceptions and returned those picks for 303 yards. Add to that a total of 147 tackles while a Bulldog and you can see why Georgia placed him in their Circle of Honor with other outstanding athletes to wear the red and black. In the secondary, he helped define Erk Russell's aggressive and attacking defense. It's a fitting tribute to Woerner's college career that his last interception (and second in the game) helped seal the win for the Dawgs in the 1981 Sugar Bowl against Notre Dame, giving them an undefeated season and the consensus National Title. And here we are, more than three decades removed from Scott Woerner's gridiron accomplishments and we still remember his lasting legacy with great appreciation, fondness and respect. In an era when highlights were more often given through a radio wire or while sitting in attendance than on instantaneous sports shows at all hours of the day, Woerner gave us highlights and memories to keep forever. An opportunistic defensive player and an elusive, gritty return man, Scott Woerner earned every accolade the University of Georgia could give him. And yet there is one more he's earned on a national level that could honor his career as a student-athlete like none other. For those of us within the Dawg Nation, there is no greater compliment one can give another than to describe them as a Damn Good Dawg. It is a title bestowed to many, but those who competed against our rivals and helped defeat our opponents earned it many times over. Scott Woerner is such a player. He proved it as a four year letterman and All-American player under Vince Dooley. The College Football Hall of Fame is about longevity, permanence and excellence. And it is place this Damn Good Dawg deserves to call home.